Big Box Storage offers San Diego storage delivery and pickup services throughout all of San Diego County, California. The company’s service area is shown in the map to the right and is, generally speaking, bordered by Fallbrook in the north, San Ysidro in the south, Alpine in the east, and, obviously, the Pacific coast in the west. Over 95% of the population of San Diego County resides within the company’s service area. Storage delivery and pickup within most of this area is provided free of charge (based on a three month min. term). 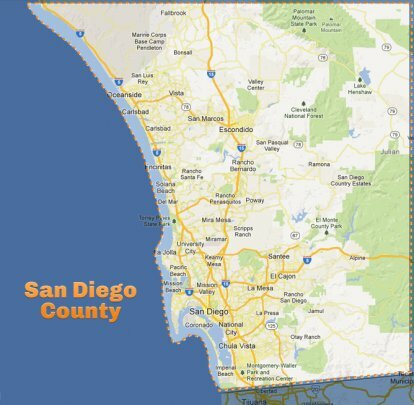 For addresses beyond the noted area, yet also within San Diego County, delivery and pickup services are available for a nominal fee (rates vary depending upon the zip code). To check delivery rates as well as rental rates for zip codes within the service area and beyond, please visit the rates and promotions page. Beyond storage services, Big Box Storage also offers long distance shipping services from San Diego to service areas across the United States. As the company ships to over 18,000 cities and towns across the country, you’re able to enjoy the convenience of loading your rented Big Box at your current address in San Diego County and then unloading it at your new address hundreds or thousands of miles away. You’ll also find that the shipping service is not only convenient, but quite economical as well. The company’s long distance shipping rates are among the most aggressive in the industry.